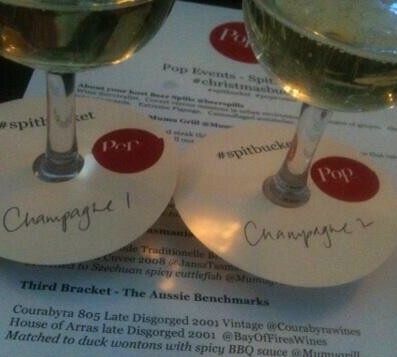 Those of you who follow me on twitter will know that I attend a number of regular events; Alestars at the Local Taphouse, any tasting by Sommeliers Australia and one that I talk about the most – #spitbucket. #spitbuckets are regular wine dinners with ever changing subjects, fantastic guest hosts, some great wine, great food and great people which are live shared across social media, especially Twitter. They are the brain-child of Poppy Gresson (@poppygresson,) starting in 2011 as a promotion for Darling Harbour’s Coast Restaurant where she was General Manager. Poppy left Coast last year and set up her own event management company, Pop Events and reinvented #spitbucket. Themes over the last nine months have included New South Wales wines, biodynamic wines, natural wine, sparkling wines and the Hunter Valley Wine Show trophy winners along with an incredible #whiskybucket. Around ten wines are supplied by social media savvy wineries each night and are always high quality and interesting. Wines are served in brackets of two or three usually similar styles or different vintages of the same wine. A number of venues are used with MuMu Grill in Crows Nest the most regular. Craig Macindoe at MuMu is certainly generous when it comes to food and expertly matches the courses with each brackets of wine. Fix St James is another regular venue and it goes without saying that the matches are spot on (oddly enough Stuart Knox from Fix has hosted a few #spitbuckets but never at Fix itself.) 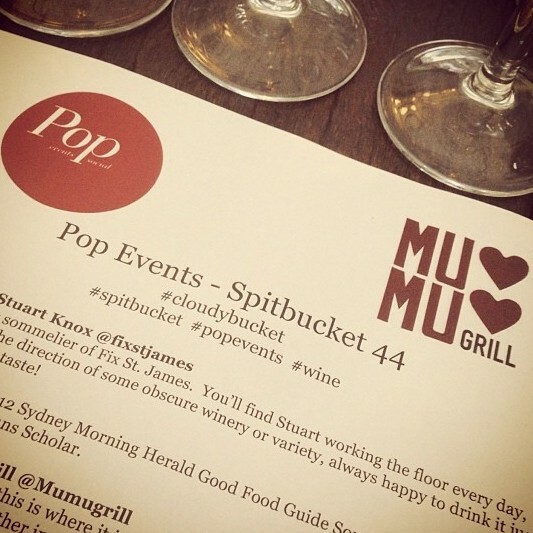 Great wines and food make #spitbucket excellent value for around $70. It’s never a room full of people staring at their phones, the nights become pretty rowdy with plenty of interaction. The guest hosts are always knowledgable but have a lot of fun with it. Patrick Haddock recently hosted for an entire night in his Beer Spills, Wine Survivalist character. Winemakers who are not in the room interact with the attendees across social media, which adds a great twist to the event, answering question and often pushing to find out how their wine fared against the others. 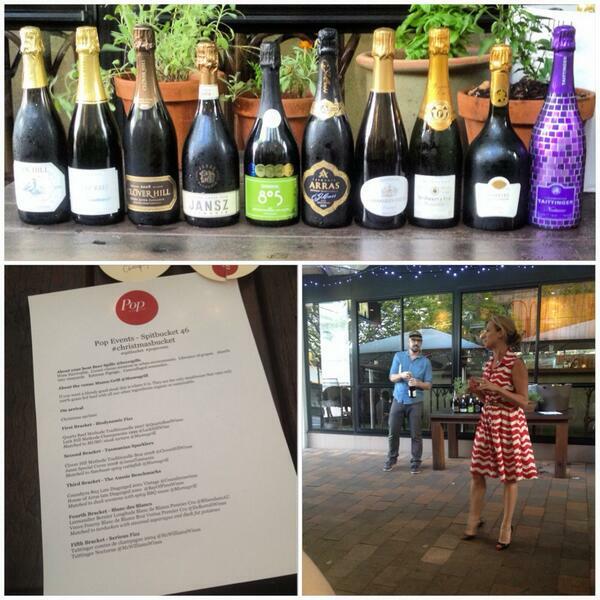 Spectacular wines at the #christmasbucket sparkling wine event hosted by @poppygresson and @beerspills. Poppy has a lot of events planned for 2014 including Summer of Riesling at Fix St James next week and #chardonnaybucket in early February. I’ve heard rumours of a #rumbucket which sounds a little dangerous. The dinners are limited to 24 guests and always sell out. Follow @pop_events on Twitter so that you don’t miss out. #spitbuckets are a great example of how both drinking wine and social media are supposed to be fun. I’d heartily recommend them to anyone. This entry was posted in Australian Wine, Natural Wine, NSW Wine, Restaurants, Sydney, Wine on January 23, 2014 by William Wilson. Good stuff – look forward to going to a few more this year.